Preheat the oven to 375 F. Remove wrappers from the chocolates. In a large bowl beat the shortening and peanut butter until blended. Add sugar and brown sugar and beat until fluffy. Add egg, milk and vanilla and beat well. Stir together the flour, baking soda and salt. Gradually beat it into the peanut butter mixture until combined. Shape the dough into 1 in. balls. Roll in the bowl of granulated sugar and place on an ungreased cookie sheet about 1 in. apart. Bake for 8-10 min. or until lightly browned. Remove from oven. 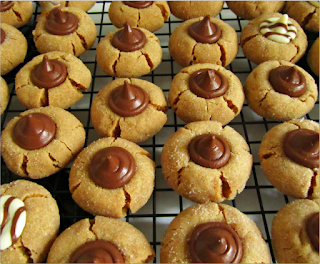 Immediately press a kiss into the center of each cookie; the cookie will crack around the edges. Once you have pressed all the kisses in, let them sit for a min. and then come back and gently smoosh the kisses into the cookie once more. This prevents them from falling off while eating. Remove from cookie sheet and cool on a wire wrack. These cookies are ALWAYS made during the holidays at my family's house. My dad loves them! Great classic that will never get old!